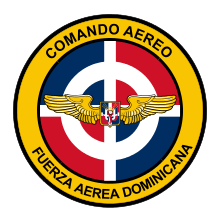 In 1932 the El Arma de Aviación del Ejército Nacional was formed as part of the Dominican Army. Until 1942 only about a dozen aircraft were purchased. The service was renamed Compañia de Aviación del Ejército Nacional on October 26, 1942. Whilst granting base facilities to the United States during World War II the Dominican Republic received limited quantities of Lend-Lease military equipment. In 1947 a group of Dominican Republic exiles from Cuba tried to invade the country. The government wanted to receive large quantities of bombers and fighters aircraft from the United States, but the government blocked these sales and prevented sales of the Canadian government to President Trujillo. But agents of the president managed to buy some Beaufighter and Mosquito aircraft from the United Kingdom. After signing the Rio Treaty 1947 the Dominican Republic received large quantities of aircraft, for example 25 P-47D fighter-bomber and 30 AT-6 trainers from the United States. With this influx of aircraft the Compañia de Aviación expanded and became an independent service on January 15, 1948, and was renamed Cuerpo de Aviación Militar Dominicana. It moved its headquarters to Base Aérea Presidente Trujillo, in the capital's suburb of San Isidro. On the 22nd of September 1998 Hurricane George struck San Isidro the main FAD base and destroyed one hangar and severely damaged another, destroying the aircraft in both hangars. The natural disaster saw the FAD new aircraft enter service such as eight ENAER T-35 Pilláns that were delivered in two batches, the first in November 1999 and the second in January 2000. During the same period three CASA 212-400 transport planes were ordered. The Dominican Air Force was offered 3 Sikorsky SH-3 Sea King helicopters by its U.S allies, but turned the offer down due to that it could not afford the maintenance. In 2007 the Dominican Air Force announced that it will purchase 8 Embraer EMB 314 Super Tucano aircraft from Brazil. By the end of 2008 the purchase was approved and the first two aircraft were delivered in 2009. The Dominican Air force recently acquired an EL/M-2106NG - Air Defense Search Radar - ADSR from Israel. In January 2015 the president of the Anti-narcotics agency announced that a Tecnam MMA (Multi Mission Aircraft) will be acquired for maritime surveillance. The contract was signed in September 2015 by Tecnam and the DRAF, the aircraft will be delivered on 2016 making the Dominican Republic Air Force the first military user of this aircraft. Previous combat aircraft operated by the Air Force consisted of the P-51D Mustang, F-86 Sabre, de Havilland Mosquito, PBY Catalina, B-17, A-37 Dragonfly, and the C-47 . Other retired training aircraft and helicopters were the BT-13 Valiant, T-6 Texan, Alouette II/III, Sikorsky H-19, and the Hughes OH-6. 1 2 3 4 5 6 7 8 9 "World Air Forces 2015 pg. 14". Flightglobal Insight. 2015. Retrieved 9 April 2015. ↑ "World Air Forces 1955 pg. 623". flightglobal.com. Retrieved 21 March 2015. ↑ "World Air Forces 1973 pg. 145". flightglobal.com. Retrieved 21 March 2015.